Hello, I am Miss Young. I received the following email. It is a socalled "Advance Fee Fraud" letter, where I am invited to an employment program and offered a job abroad. These stories are all lies, and if I respond, sooner or later I will be asked to pay a fee. If I pay, another fee will quickly come up, and it will continue that way until I give up or run out of money. I will never get the job, because it never existed. Most of these letters are spread via dating sites. Subject: THE RENEWABLEUK APPLICATION LETTER. I am very pleased to inform you that your CV under my supervision has been received and successfully uploaded into our employee databases, you are therefore required to submit your Application Letter for finial consideration. 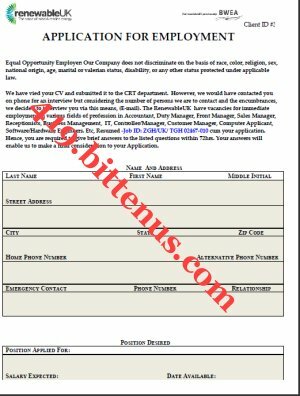 To complete your employment confirmation, i will be expecting an email from you to confirm your acceptance. That will be all for now, once again congratulations and welcome aboard. NOTE : IT IS IMPORTANT THAT YOU CHECK YOUR EMAIL DAILY AND REPLY ALL THE EMAILS, SINCE THIS WILL BE OUR PRIMARY MEANS OF COMMUNICATION !! !